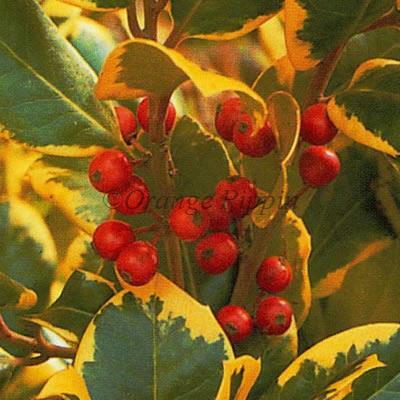 Ilex x altaclerensis 'Golden King' or Holly 'Golden King' is a small, bushy evergreen tree or shrub with broad, slightly spiny, dark green leaves that are attractively margined with bright yellow. It features small white flowers which are followed by brownish-red berries in autumn, if planted next to or close by a male variety of Ilex. This bright evergreen shrub would look wonderful planted among the mixed border for architectural interest, against a sunny wall, fence or as hedging. Contrary to its name, 'Golden King' is actually a female holly, and will only produce the characteristic autumnal berries if planted near to a male variety - such as Ilex aquifolium 'Ferox Aurea' or Ilex aquifolium 'Ferox Argentea'. The hermaphrodite hollies such as Ilex aquifolium 'Pyramidalis' and Ilex aquifolium 'J.C. Van Tol', and Ilex aquifolium 'Golden Van Tol' are also compatible.